I'm not sure how I feel about Lily Collins as Clary. And what is happening with those eyebrows?? 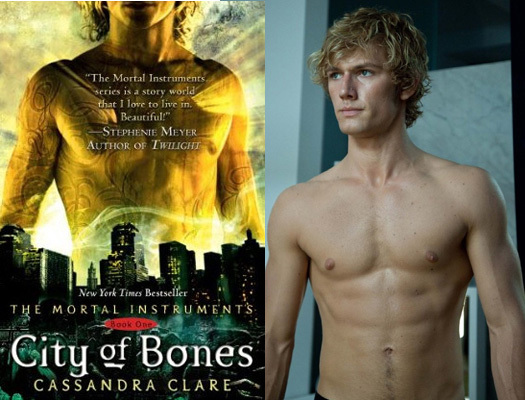 As for Jace - holy hottness! yes, Alex Pettyfer can play him :-) However even though Jace is sinfully hot - it's his attitude that makes him Jace! so it's really about who can ACT the part, ya know? I'm so glad they are choosing B-list? not so hot? actors for this movie. KStew royally screwed up Bella. They nailed Clary's hair at least! I'm hoping she can act - then I'll decide if she's Clary. No one will ever be my Jace. I've accepted it. Holy Hotness is right! Love Jace! Oh Kari, I have to laugh because you said they Nailed Clary's hair and my first thought was well they better dye her hair red! Isn't that funny how we thought totally opposite things! Love ya dear! Otherwise the cut of her hair, her body, and face I totally think fit her. Hopefully they are both better actors than Rob and Kristen! The only problem I have with Alex Pettyfer is that in some pictures he looks very... not Jace. I can live with it though, he's better than some of the other fan-suggested actors. As for Lily Collins, I can see it. They need to work a bit with the hair, though. I'm trying to keep in mind that no one is ever going to fit our perfect mental image of the characters. I'm more curious to see who they're going to cast for Magnus.